As per my plan, I skipped my first optional, and rather expensive, game drive through South Africa’s famed Kruger National Park. Instead, I hung out at the tiny, freezing cold pool at our no-frills safari camp (not exactly what I had envisioned). 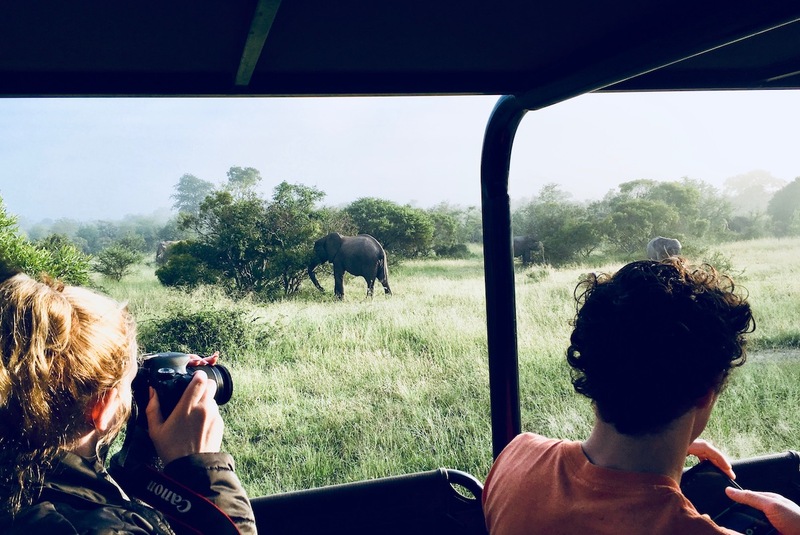 But, when presented with the option to upgrade from the planned day-long drive through Kruger in our tour bus the next day to an all-day drive in an open safari truck, I decided to take the plunge. To be honest, the idea of a Jeep-like vehicle always interests me—I’m a sucker for adventurous transport. However, it still wasn’t quite a game changer—I held to my planned strategy of skipping “extras.” And after the full day’s drive—with a 4:30 am wake up call, coming after several days of tour bus travel—I was wiped, so skipping the extra night drive in Kruger just made sense. The group who did the night drive came back positively jubilant. Along with the usual night-drive sightings, they had seen the elusive leopard. The notoriously number 5 of the Big Five. Even the pros can go months and months without seeing a leopard. For the rest of my life, I will regret skipping that drive—at the time, I was thinking “It’s Day 6 of 30, this is a marathon, you need to pace yourself, get some rest.” At the time, I didn’t regret the rest I got, but I did regret the relatively low cost of the Kruger night drive—just US$20, a steal in the world of safari. Today I regret the leopard. After Great Zimbabwe, we headed for the tour’s next major milestone—Victoria Falls. But there were a few stops in between. Animal stops. Stops I hadn’t paid much attention to when reviewing the itinerary, except for the brief opportunity to see San (Bushmen) cave paintings. 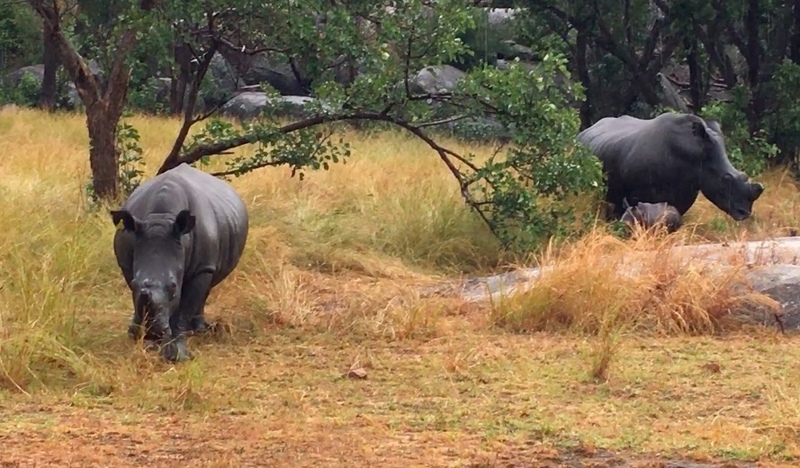 We stayed just outside Matobo National Park, a refuge for the endangered white rhino. Rhinos are under threat of poachers because of the erroneous notion in east Asia that their horns have medicinal value. They don’t. Rhino horns are basically the same as my fingernails. The public does not know the exact value of the horns on the black market, nor do they know the current number of rhinos in the various parks and reserves—this information is kept confidential to keep potential poachers in the dark. To make them less valuable to poachers, rhinos also have their horns removed by game management every few years. And safari drivers do not report rhino sighting on the radio, lest poachers overhear. Conservation is a group effort. 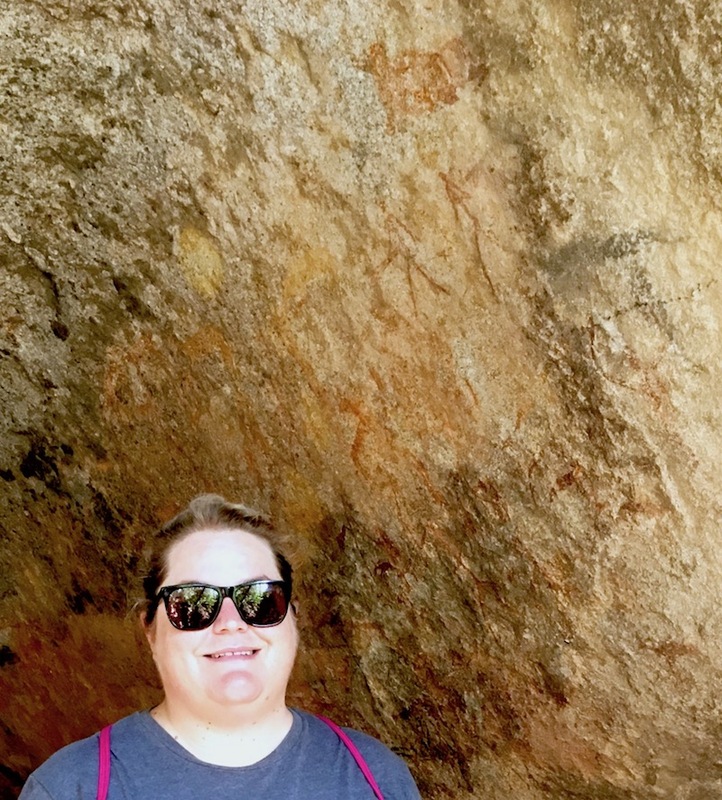 But despite this, my focus for this day was the itinerary’s optional activity of seeing 2000-year-old rock paintings of the San people (Bushmen). There had been several instances where reality didn’t live up to what was published in the trip’s itinerary notes, so I made sure this option existed. We didn’t get to visit a major sites of paintings, but luckily, there were some on the property of our accommodation and we had a short, guided tour to the site after breakfast. It was the highlight of my day. Or so I thought. One of the many examples of San rock art in a small cave near our accommodation near Matobo National Park. You see, our included activity for the day was a late afternoon “rhino walk” in Matobo. So later that day, we piled into open safari trucks for another fun ride—in a freezing cold rain storm. Open safari trucks are not quite as fun in rain storms. Huddled under blankets, trying to shield our faces, we acted out an episode of Storm Chasers on Sam’s GoPro. And forty-five minutes later, after the rain had mostly stopped, we pulled on to the side of a narrow dirt road in the park and proceeded to follow our guide, silently and single file, into the bush. Everything we had kept dry on the long drive was quickly soaked through as we bushwhacked through the wet grasses and swampy collections of rainwater. I resolved to take this whole afternoon as one of those character-building experiences; a day of mild discomfort that would eventually be a funny story. Still not sure if he was joking or not. Lani swears he was serious. When Junior finally saw us (probably thanks a few group member’s no-so-neutral rain gear), he suddenly reared up and ran back to Mama. But with a calf to protect, she was not having it. Less than fifteen seconds later, Mama mock charged Junior, sending him running straight for us. We scattered, but in truth there was nowhere to go, as we were caught between a rock and a rhino. Luckily, he cut off his run after a few metres and things went back to status quo. But we had clearly overstayed our welcome, so after catching our collected breaths, we headed back to the road. It was a Damascene moment, if ever there was one. By the time we left the next day for Hwange National Park, I had fallen in love with the entire concept of safari. *The Big 5 are the lion, the leopard, the elephant, the buffalo, and the rhinoceros. It’s an arbitrary collection of animals, so called because they were the most difficult or dangerous for the big game hunters of colonial times. The Big 5 share few other characteristics. I mean, you can’t enter a game reserve or park without seeing elephants. And rhinos are fiercely protected—technically, I saw my first rhino at a watering hole in private game reserve behind a gas station on the highway. Buffalo are less common, but they basically stand around in water, so they aren’t hard to spot, eventually. It’s the cats that are the prize—lions are fairly common, leopards are elusive, and cheetahs aren’t even in the Big 5 club.